Web Summit founder Paddy Cosgrave has defended not raising the housing crisis directly with the Taoiseach. 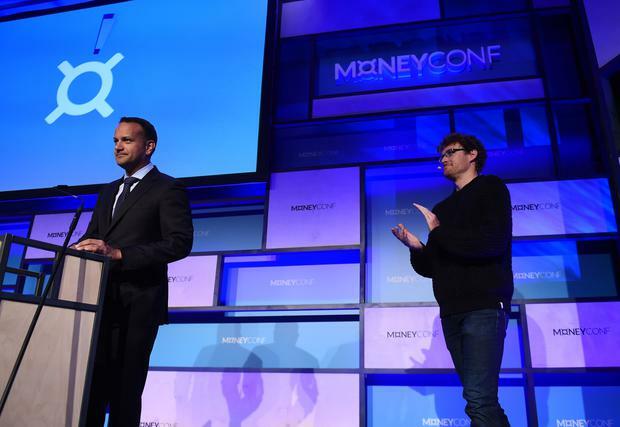 Speaking on RTÉ's Morning Ireland, Paddy Cosgrave said he attended the 'Take Back The City' protest in Dublin on Saturday, but has not directly spoken to the Taoiseach about the issue, despite Mr Varadkar attending his MoneyConf event last June. Mr Cosgrave said it was "reprehensible" after RTÉ presenter Audrey Carville asked him six times if he had raised the housing issue directly with Mr Varadkar. "I find this reprehensible," he said. "Tens of thousands of people have been raising it. Have I raised it? Yes. I took part in the protest last Saturday. "Have I tweeted about it? Have I tweeted him directly? Absolutely." After being asked again if he raised the issue directly with the Taoiseach, Mr Cosgrave questioned RTÉ on their own coverage of the crisis. "Have RTÉ covered the fact that this Government has never said so much as a word about farmers in this country who have occupied farm after farm, halting the forced sale of those farms for years now? "Have you pointed out the hypocrisy of that? That a group of people believed to be from west Dublin are castigated as 'criminals' and 'disgraceful', why? Because Fine Gael knows they don't vote for them. "For more than two years I have been raising these issues directly with the Government, with special advisors to a number of ministers. I've met with the Minister for Housing. "These issues are not just mauling society, they are affecting the entire economy. They're shuttering small businesses, they're forcing multinationals for the first time in almost the history of this state to publicly and openly criticise a sitting Government. It's unprecedented." Earlier in the interview, Mr Cosgrave told RTÉ's Morning Ireland that during last Saturday's 'Take Back The City' protest, he walked alongside people from Google, Indeed, Facebook and LinkedIn. "I grew up on a farm and when my neighbour occupied a building that was in use in Dublin last summer for seven full days with the IFA Grain Committee/Department of Agriculture, it wasn't stormed by heavy police officers dressed in riot gear, they were left peacefully there to protest for seven days. "Fine Gael never came out and spoke out against members of the IFA and farmers in this country as 'criminals' or as 'disgraceful', words used by ministers over the last week. That tells you something about Fine Gael. "Fine Gael has essentially decided that they think protesters in the city are of working class backgrounds, that they're of poor, disadvantaged backgrounds and they have decided to caste them as criminals. "But when farmers occupy farms all over this country, which they have been doing for years now, there is not a word out of Fine Gael and I think that should tell you something about the operating basis of Fine Gael as a party in modern Ireland." A spokesman for the Taoiseach's Office told Independent.ie: "The Taoiseach's Private Office has confirmed that there has been no written correspondence received from Paddy Cosgrave regarding Housing. "Under the Regulation of Lobbying Act 2015, it is the responsibility of the person who makes, manages or directs lobbying activity to register and submit returns."